So my breakfasts have become same-old, same-old. Not boring really but of fun. 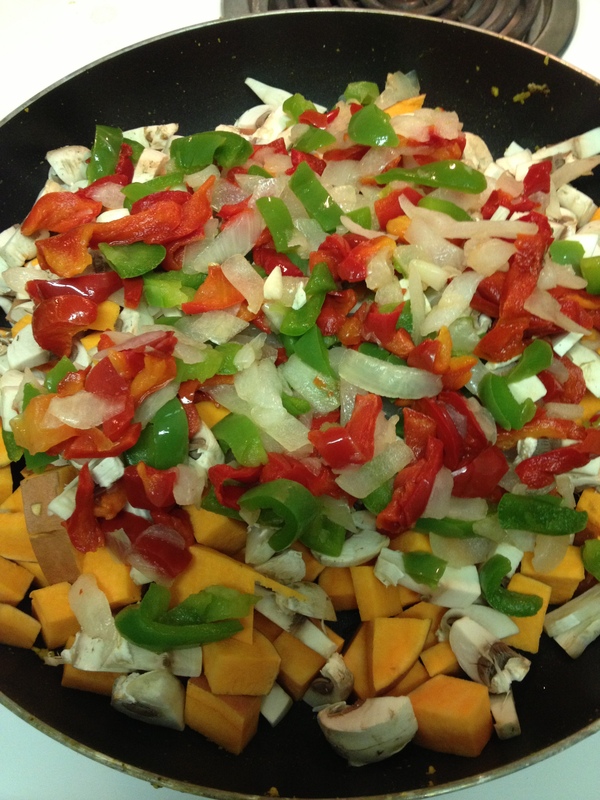 I have started wishing for something new and unexpected and since I haven’t done any real breakfast cooking in a while I decided to make a Southwest Scramble. Scrambles are notoriously fatty, with loads of cheese and eggs. Well no eggs obviously and no cheese here either. 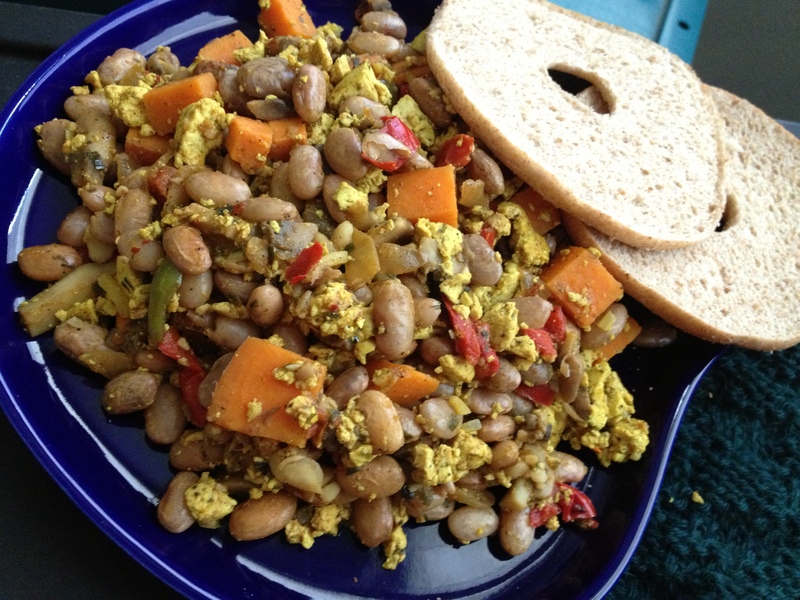 I used Nasoya Black Soybean Tofu, which I love, as my eggy substitute. 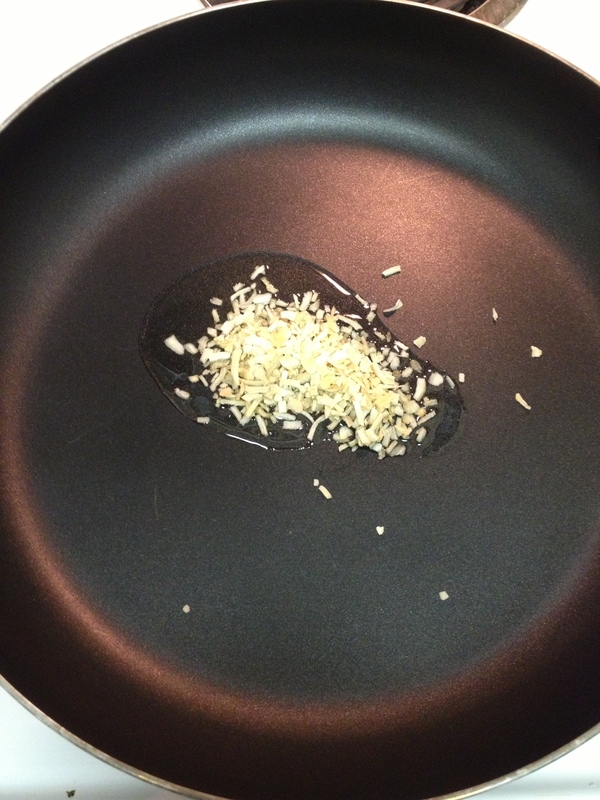 I drained most of the liquid from the tub o’ tofu (I like to leave most of the liquid in the tofu that way I don’t have to use any or very little oil) and chopped it chunkily into the pan. Turned it to medium high then sprinkled my spices. Turmeric turned it the classic yellow and I also add, black pepper and red pepper flakes, garlic powder and salt and onion flakes-oh, how I love onion flakes! 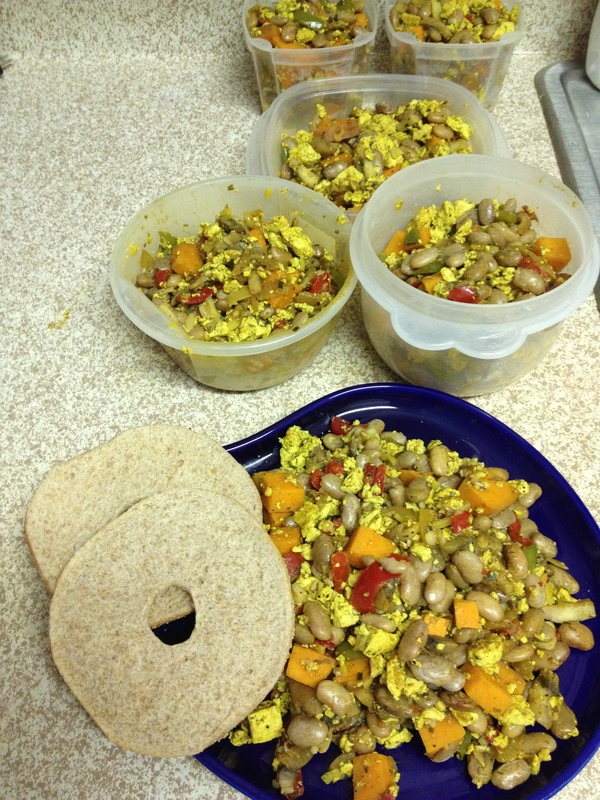 I have to say, the tofu almost didn’t make it into the scramble it was so good I just kept picking at it! I finally had to cover it with a towel because I couldn’t technically have a scramble without a yellow substance right? 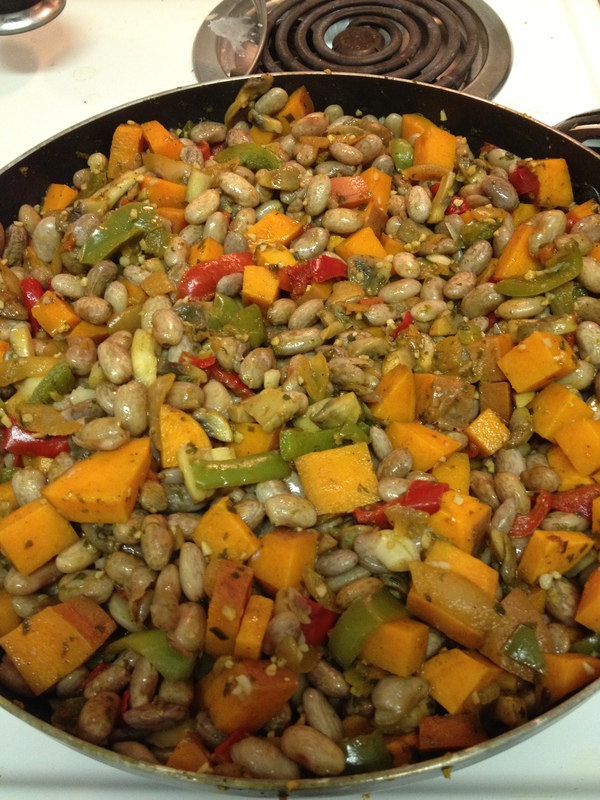 To make it even more Southwesty I made my own beans and used a sweet potato. For the beans I measured out two cups dried beans in a colander and rinsed, then sifted them into a small pot to get out any dirt or bad ones. Then I filled the pot with water-enough to cover by 3-4 inches. The beans really expand and grow, so really cover with water. I boiled them on medium-high for 30 minutes and they were perfect for me. Drain then rinse and complete. 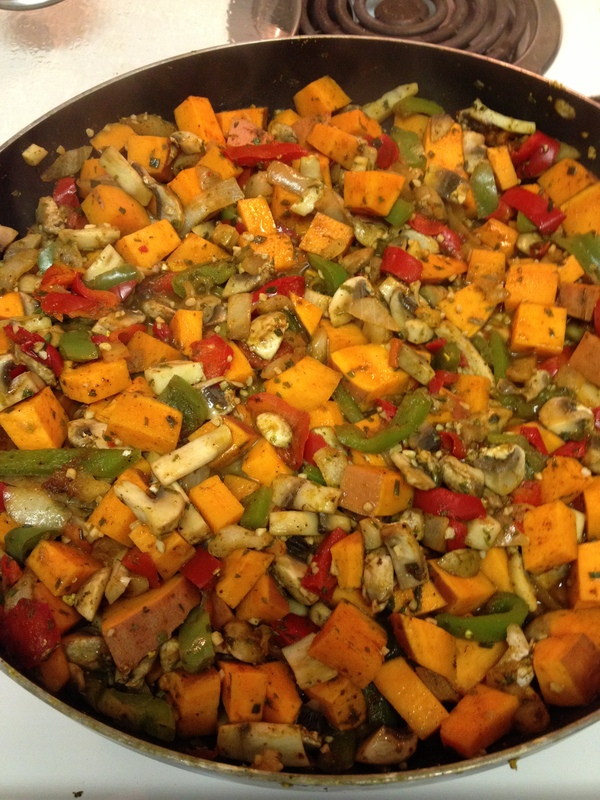 For the sweet potato and the rest of the veggies, I cut everything into small chunks and poured everything into a large pan and sprinkled the remaining spices and covered with the lid. 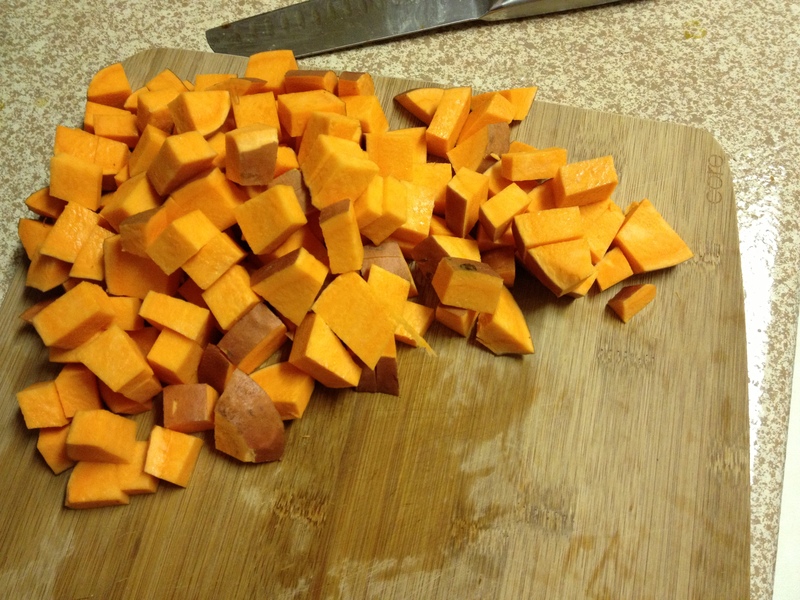 I let everything sweat together until the sweet potatoes had softened. While the veggies were doing their thing I used a masher to mash the beans. I didn’t mash them to smooth or anything, just wanted some different textures going on. 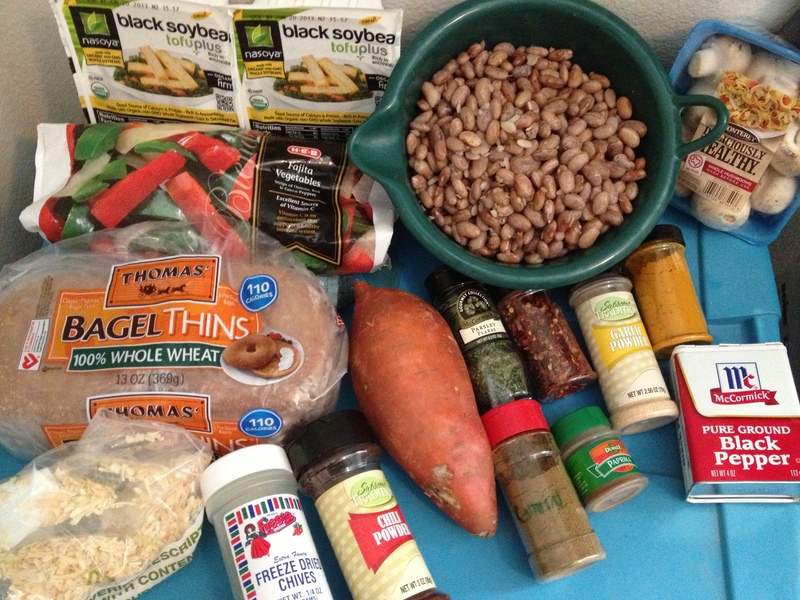 When all veggies were done I poured in the beans and mixed everything them folded in the tofu. 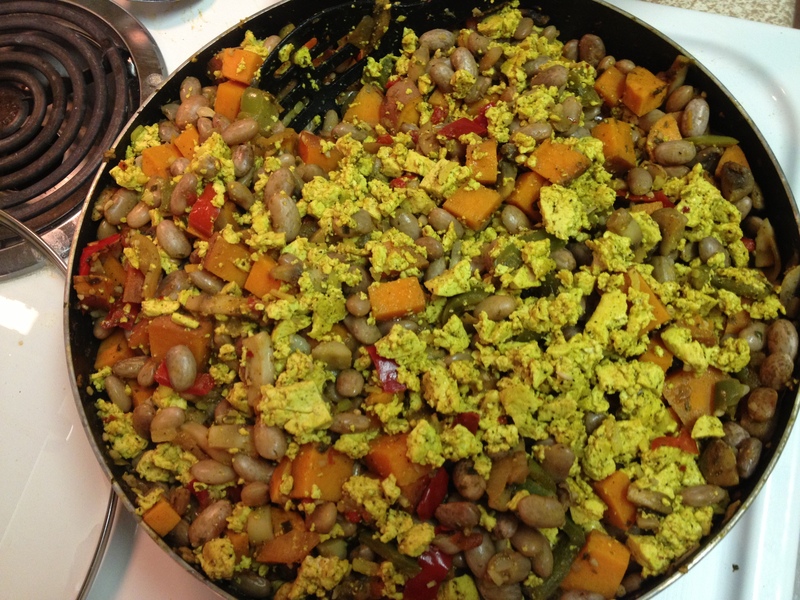 This is not a real long process, and if you are like me and can eat breakfast for dinner you could totally do this in under 30 minutes by using canned beans, and less tofu and sauté the tofu and veggies all together. Mmmmm, with folded vegan Thomas’ Bagel Thins-yum! 1. 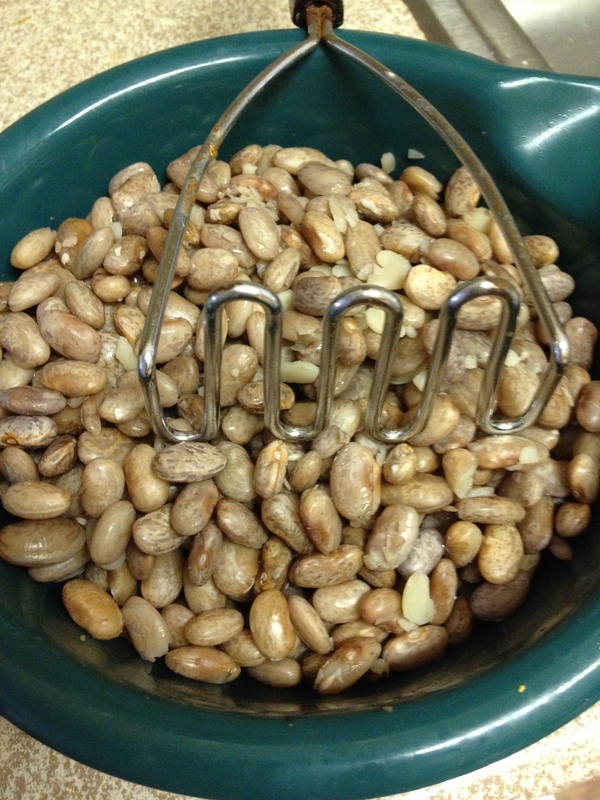 Measure beans into colander and rinse. Pick Out bad ones and grit then pour rest into pot. Cover with water-3-4 inches above beans. Boil on medium-high for 30 minutes. 2. 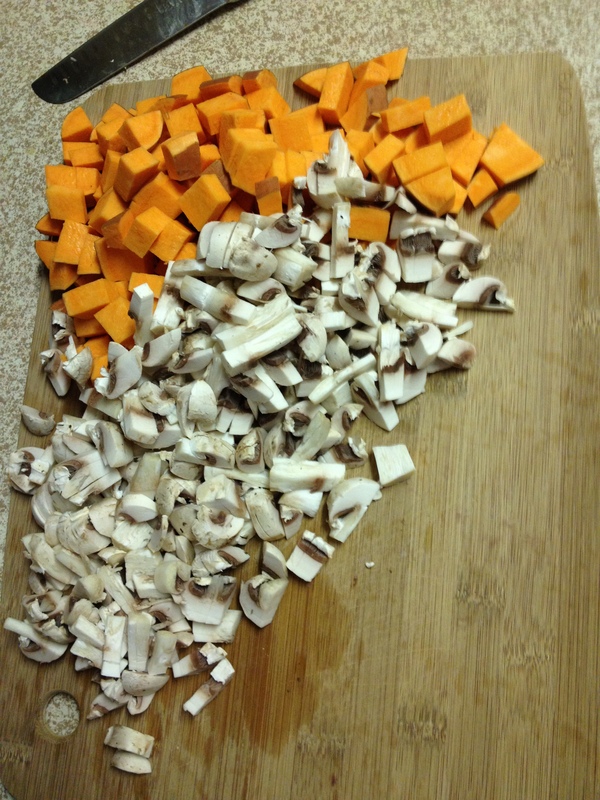 Drain most liquid from tofu and cut into chunks and drop into pan. Turn on medium-high. 3. 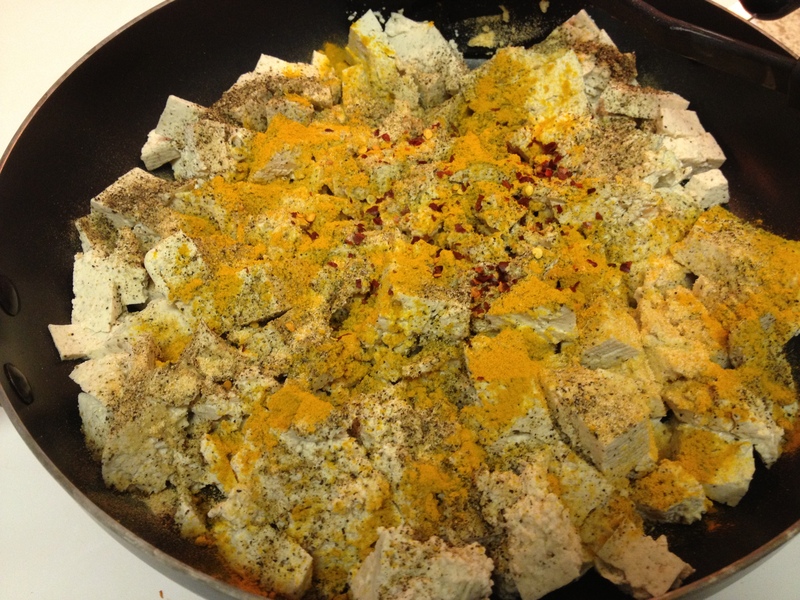 Sprinkle tofu with turmeric, black pepper, red pepper…..
4. 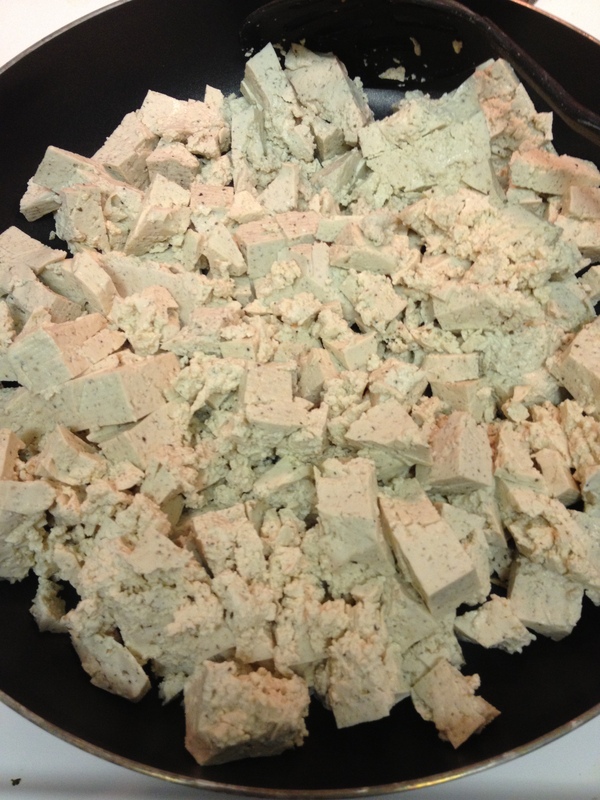 When tofu is finished, pour into bowl and cover with paper towel. 5. 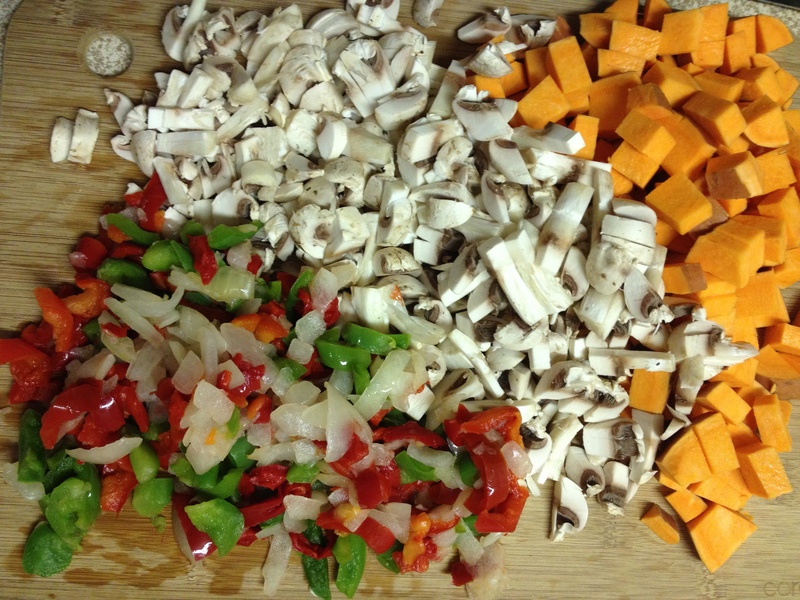 While tofu is sautéing, wash and chop the sweet potato, mushrooms and fajita veggies into small chunks. 6. 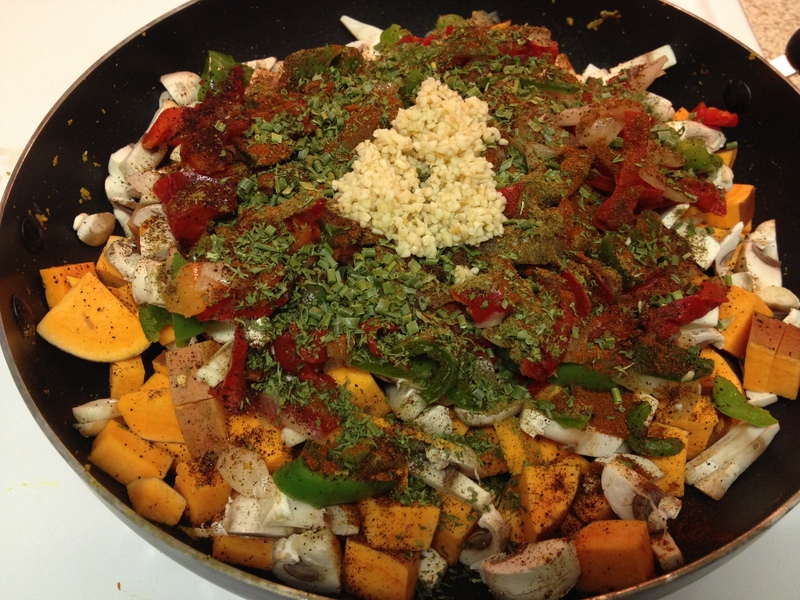 When pan is free dump all veggies into pot and sprinkle with remaining spices. 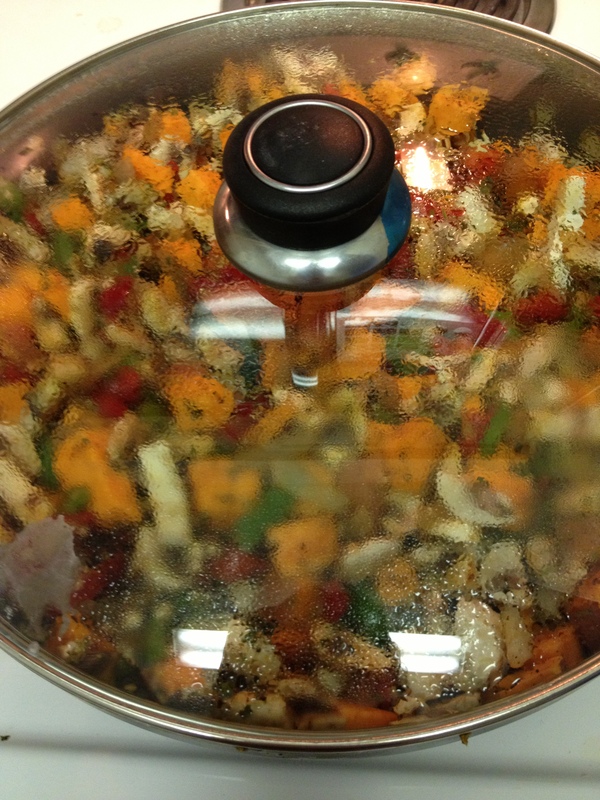 Cover with lid and keep heat on medium. 7. Mash beans to desired consistency. 8. 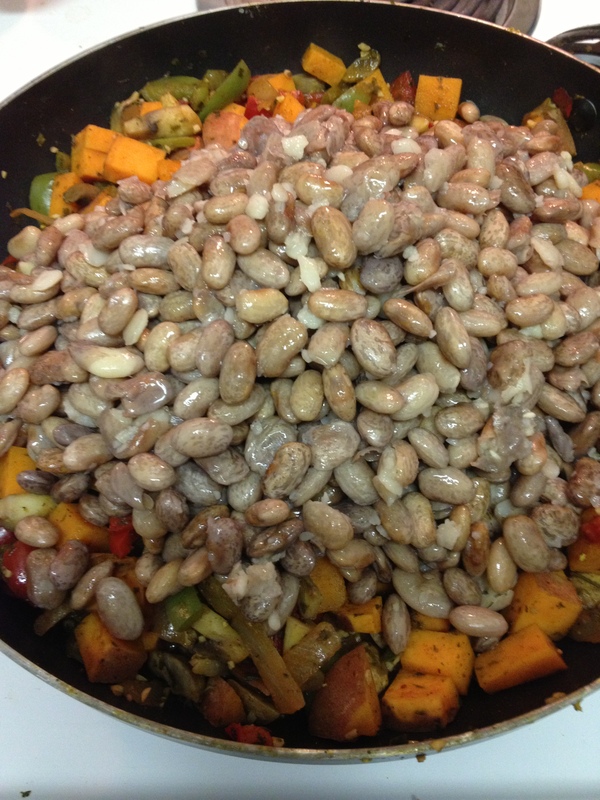 When veggies done pour in beans and mix. Add tofu a little a time and fold in. 9. Portion out and enjoy.